"the road is almost disappearing now..."
This film takes us on a journey along Óshlíð, an abandoned coastal road which is considered to be one of the most dangerous, and beautiful, in Iceland. Following the construction of a mountain tunnel in 2010, the road was closed and is now in the process of being rapidly reclaimed by both the mountain and the sea. The film delves into the stories of this road and its relationships with the people who maintained, traveled and died upon Óshlíð. Through these voices it reflects upon a post-human landscape and the nature of mortality. The title embodies the topographical and compound nature of this film. 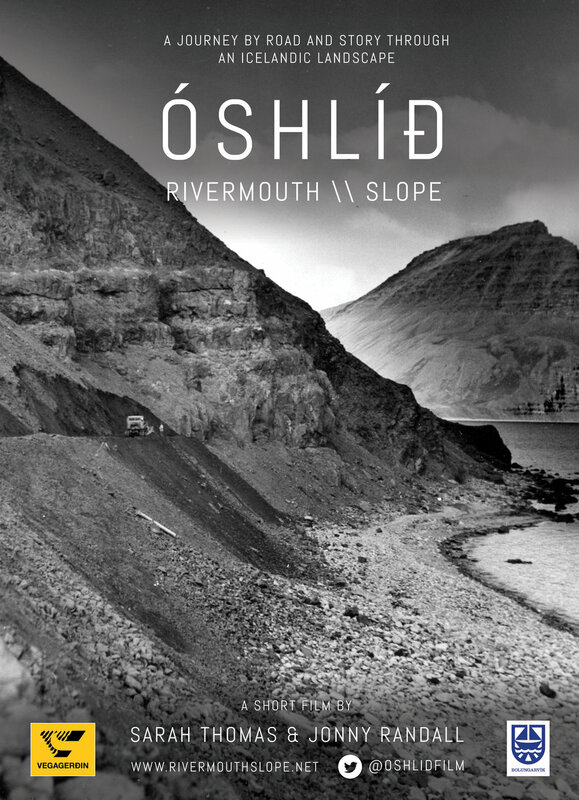 Óshlíð is an Icelandic word comprised of ós (river mouth) and hlíð (slope). Óshlíð is both the name of the road, and the place - from which it came and to which it will return. Sarah is a non-fiction writer and documentary maker with a background in anthropology. She is interested in dwelling deeply in a place, the stories we make and the relationships we have with the environments we live in. She has lived across the world in various locations from the Equator to the Arctic. Following the financial crisis of 2008, she lived in Iceland's Westfjords region for a number of years bearing witness to a period of immense environmental and social change, about which she is writing a memoir. She is doing a PhD in creative writing at Glasgow University and has published essays in Dark Mountain, Earthlines, Caught By The River, Zoomorphic, Driftfish and Weatherfronts: Climate change and the stories we tell. Jonny is a freelance artist working with film and live performance in Cumbria, England. His practice involves primarily using documentary as a medium through which to bear witness to the unique stories of people and places. He is fascinated by the relationships between identity and landscape, particularly relating to ideas of north. For details on other projects, please visit his website. 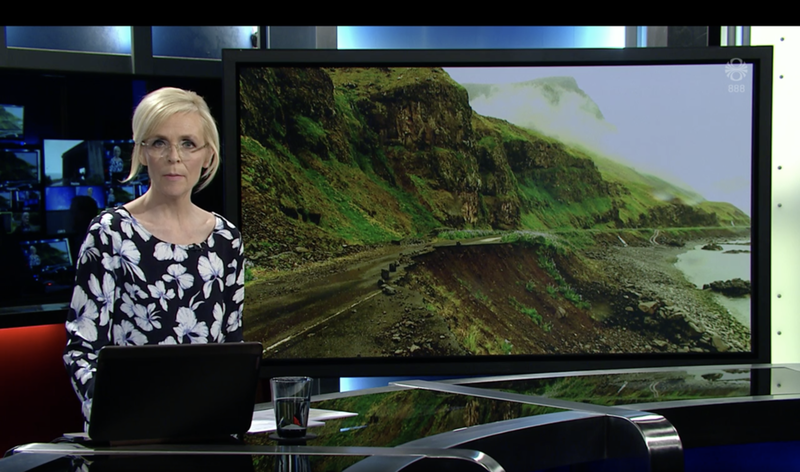 A couple of days before the community screening on the road itself, whilst converting an avalanche tunnel into an off-grid cinema, co-creators Sarah and Jonny were interviewed by Halla Ólafsdóttir for RÚV - the Icelandic national broadcasting network. Here's a link to the short video report, plus an article (in Icelandic). As well as the launch event which will take place in an avalanche shelter on the road where the film was made, there will be several other screenings in Iceland. Keep watching the SCREENINGS tab and @oshlidfilm on twitter for updates. We are thrilled to be launching our film on the road where it was made! In a couple of weeks co-creators Sarah Thomas and Jon Randall will head to the Westfjords of Iceland, with hot-off-the-press DVDs in their bags, for an off-grid evening event in one of the avalanche tunnels along the road. In the spirit in which the film was created, this event will also be one made possible by the community - projectors, sounds systems and generators all borrowed and the abandoned road cleared of boulders for us by the digger driver who is part of our film. We are thrilled to be making this pilgrimage of sorts, to offer what is a eulogy to a road - a historic thread of connection between communities that has now been reclaimed by nature. This screening will be on 22nd July 8pm at the first avalanche tunnel when coming from the Hnífsdalur side. Cars are not insured on the road so please come by bike or on foot. All welcome. Running time: 30 min (film) + Director Q+A hosted by Geir Sigurðsson, Project Manager of Icelandic Road Administration. Sarah will also be speaking about writing and climate change on a panel today at Hay Festival. Do come and say hello and take the opportunity to pick up the first of our cards! Thank you! Please confirm your subscription from your email account. We’re delighted to be in the opening session of the excellent Worldfilm Festival in Estonia, whose warm hospitality Sarah enjoyed in 2012 with another film. The festival takes place in Estonia’s National Museum, Tartu from 18th to 23rd March. On 18th, as well as the screening Sarah will be part of a session discussing current trends in visual anthropology. On Óshlíð, in first avalanche tunnel coming from Ísafjörður side. Cars are not insured on the road so please come by bike or on foot. All welcome.